Labour party set to vote against UK PM May Brexit plan. UK inflation and retail sales data to be out this week. The GBP/USD pair peaked at 1.3143 amid optimism about Brexit but pulled down to finish the week at 1.3068, on the back of news indicating that the Labour party is set to vote against PM May Chequers' Brexit deal. That means that if Conservatives don't support May's plan, the Prime Minister could be ousted before year end. Renewed dollar's demand on the back of trade tensions, kept the pair near the lows reached afterward, with the pair ending the week anyway with solid gains at 1.3068. Adding fuel to the fire, Sadiq Khan, London's mayor, called for a second Brexit referendum over the weekend, as he says that the UK departure for the Union will result in civil unrest. This week, the UK will release inflation and retail sales figures. Technically, the daily chart shows that the pair has retreated from a fresh 6-week high not far below the 50% retracement of the 2016/18 rally. 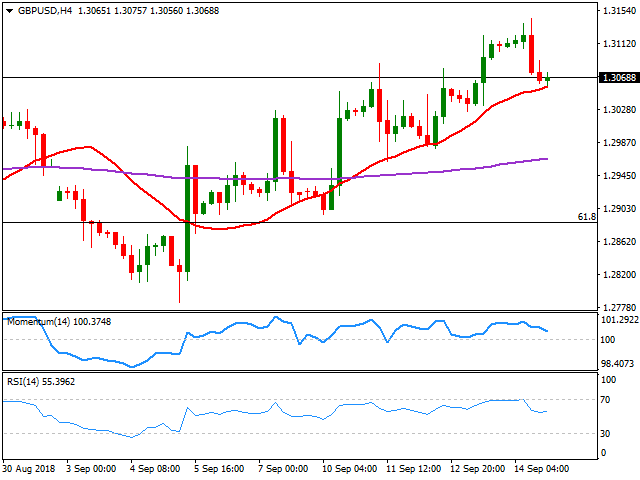 The pair remains above a bullish 20 SMA, while technical indicators are easing the Momentum nearing its mid-line and the RSI still close to overbought levels, limiting chances of a steeper decline, which will depend on Brexit headers rather than on dollar's strength. Shorter term, and according to the 4 hours chart, the technical picture is quite alike, as the decline found intraday buying at around a firmly bullish 20 SMA, while technical indicators retreated within positive levels, the Momentum still heading lower but the RSI now consolidating around 55.